These false-color images from NASA's Cassini spacecraft chronicle a day in the life of a huge storm that developed from a small spot that appeared 12 weeks earlier in Saturn's northern mid-latitudes. 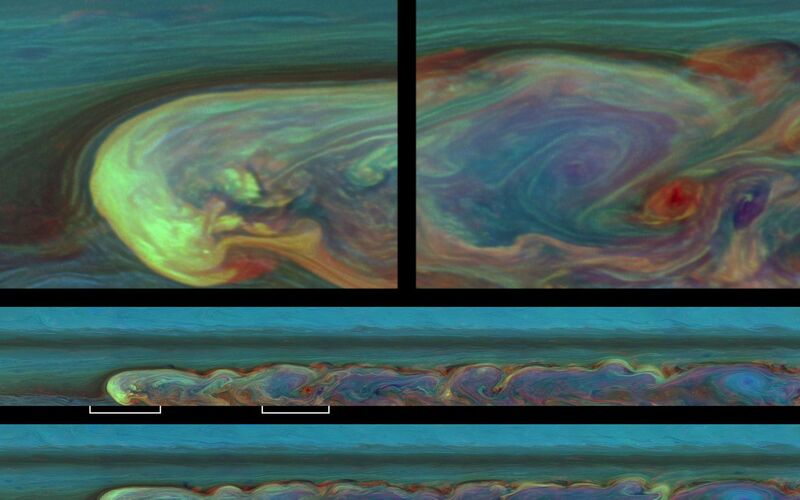 This storm is the largest and most intense observed on Saturn by NASA's Voyager or Cassini spacecraft. The storm is still active. As seen in these and other Cassini images, the storm encircles the planet -- whose circumference at these latitudes is 186,000 miles (300,000 kilometers). From north to south, it covers a distance of about 9,000 miles (15,000 kilometers), which is one-third of the way around the Earth. It encompasses an area of 1.5 billion square miles (4 billion square kilometers), or eight times the surface area of Earth. This storm is about 500 times the area of the biggest of the southern hemisphere storms (see PIA06197 and PIA12576) observed by Cassini. The highest clouds in the image are probably around 100 millibars pressure, or 60 miles (100 kilometers) above the regular undisturbed clouds. These false colors show clouds at different altitudes. Clouds that appear blue here are the highest and are semitransparent, or optically thin. Those that are yellow and white are optically thick clouds at high altitudes. Those shown green are intermediate clouds. Red and brown colors are clouds at low altitude unobscured by high clouds, and the deep blue color is a thin haze with no clouds below. The base of the clouds, where lightning is generated, is probably in the water cloud layer of Saturn's atmosphere. The storm clouds are likely made out of water ice covered by crystallized ammonia. See PIA12824 for a nearly true-color view taken about two months before this view. Taken about 11 hours -- or one Saturn day -- apart, the two mosaics in the lower half of this image product consist of 84 images each. The mosaic in the middle was taken earlier than the mosaic at the bottom. Both mosaics were captured on Feb. 26, 2011, and each of the two batches of images was taken over about 4.5 hours. Two enlargements from the earlier, middle mosaic are shown at the top of this product. The white lines below the middle mosaic identify those parts of the mosaic that were enlarged for these close-up views. The enlargement on the top left shows the head of the storm, and that on the top right shows the turbulent middle of the storm. Cassini observations have shown the head of the storm drifting west at a rate of about 2.8 degrees of longitude each Earth day (28 meters per second, or 63 miles per hour). The central latitude of the storm is the site of a westward jet, which means that the clouds to the north and south are drifting westward more slowly or even drifting eastward. In contrast, clouds at Saturn's equator drift eastward at speeds up to 450 meters per second (1,000 miles per hour). Both of the long mosaics cover an area ranging from about 30 degrees north latitude to 51 degrees north latitude. The views stretch from about 138 degrees west longitude on the left to 347 degrees west longitude on the right, passing through 360/0 degrees west longitude near the far right of the mosaics. 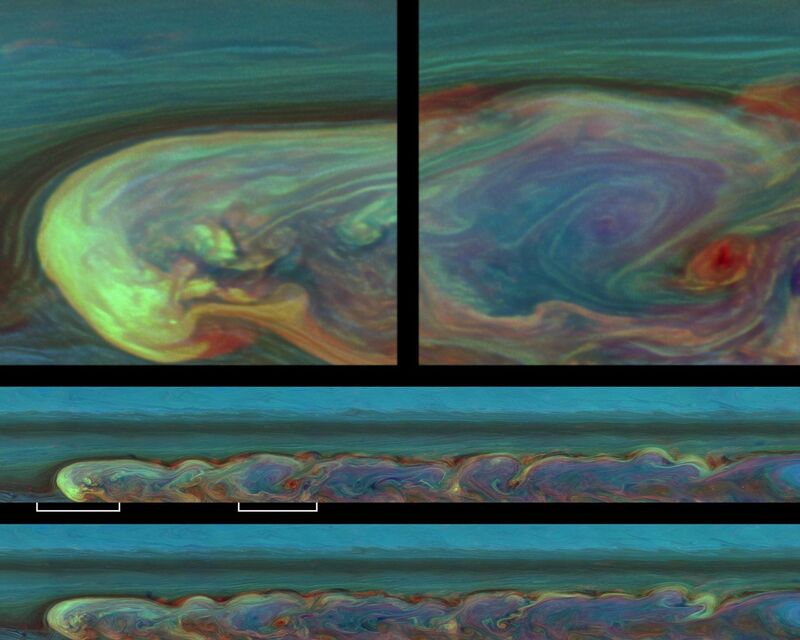 The images were taken with the Cassini spacecraft narrow-angle camera using a combination of spectral filters sensitive to wavelengths of near-infrared light. The images filtered at 889 nanometers are projected as blue. The images filtered at 727 nanometers are projected as green, and images filtered at 750 nanometers are projected as red. The views were acquired at a distance of approximately 1.5 million miles (2.4 million kilometers) from Saturn and at a sun-Saturn-spacecraft angle (phase angle) of 62 degrees. Both the top and bottom images are simple cylindrical map projections, defined such that a square pixel subtends equal intervals of latitude and longitude. At higher latitudes, the pixel size in the north-south direction remains the same, but the pixel size in the east-west direction becomes smaller. The pixel size is set at the equator, where the distances along the sides are equal. The images of the long mosaics have a pixel size of 33 miles (53 kilometers) at the equator, and the two close-up views have a pixel size of 6 miles (9 kilometers) per pixel at the equator. For more information about the Cassini-Huygens mission, visit http://www.nasa.gov/cassini and http://saturn.jpl.nasa.gov .